The month of December entails festivities, celebrations and lots of baking to commemorate the two. A box with candied orange peels was saved for December. Some golden raisins and black currants too were kept in a corner of the pantry awaiting special baking. 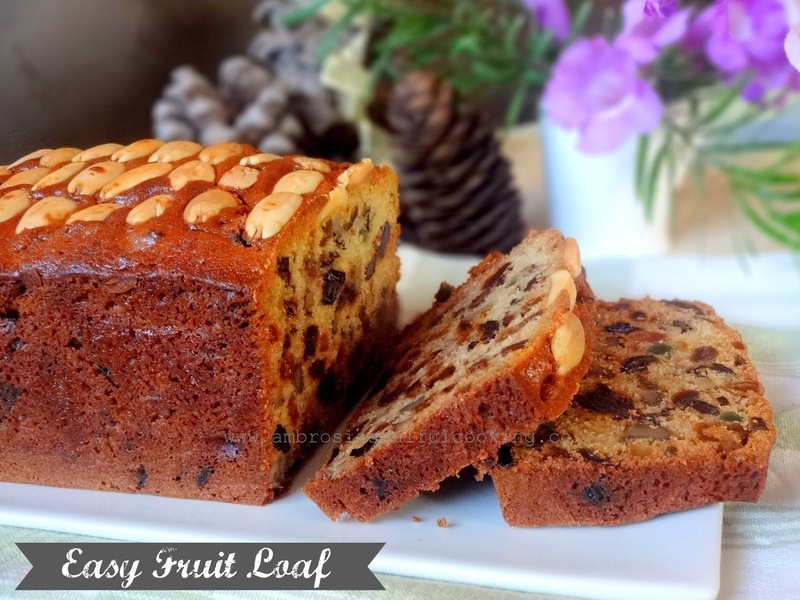 This weekend, we all got together to make our fruit loaf. Walnuts were shelled, almonds blanched and halved, peels chopped fine, dates and figs measured and sliced. It was fun. Amidst animated conversation, busy hands worked with dexterity and soon, a flavourful and rich cake was rising in the oven. It filled up the nook and crannies of our home with a heavenly aroma. Baking a fruit cake around Christmas is a ritual we love. 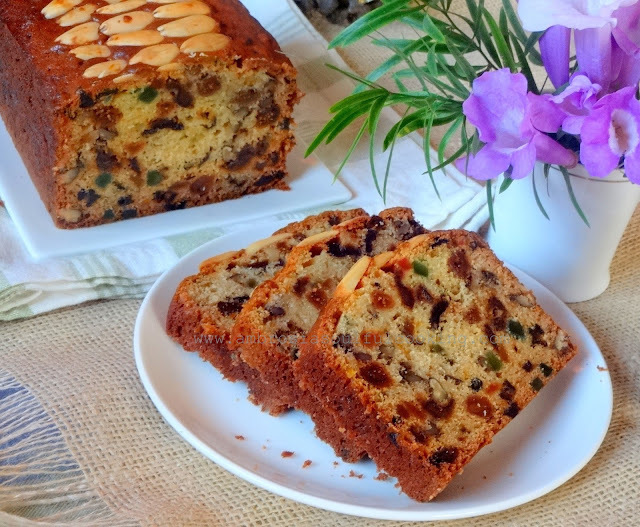 This is a no-fuss fruit cake that requires simple ingredients and is incredibly delicious. It is full of fruit bits and walnuts. Preheat oven to 165 degrees C. Line one 9x5 inch loaf pan with greased parchment paper. Extend parchment sheet along the sides like handles. It will help to bring the cake out of the pan easily. Mix flour and salt well. Keep aside. Beat butter and sugar until light and pale. Add egg. Beat till well incorporated. Take sour cream in a bowl. Add baking soda. It will begin to bubble. Keep for about 10 minutes. Take all the dry fruits and walnuts in a bowl. Add flour and toss well. This will prevent the dry fruits from sinking to the bottom of the cake. Add sour cream mix to butter-sugar-egg mix. Mix well. Now add flour in three shifts mixing well after each addition. Fold in dry fruits and walnuts. The batter will be thick and not runny. Spoon the batter into the prepared pan. Level with the back of the spoon. Bake for 1 hour 50 minutes to 2 hours. The top should turn brown and should be firm to touch. Cover with a foil if the top browns too soon. * To prepare sour cream, bring 1 cup cream to a boil. Leave it to cool. When warm, add 1 tablespoon curd (whisk it smooth). Mix well. Leave to set .overnight, or, for 6-7 hours. Use. My Tip: You may also add dry fruits of your choice. You may also brush the top and sides liberally with brandy and wrap in cling film. Repeat next four days. Enjoy the boozy cake. Hello Namita, Here after a long time. 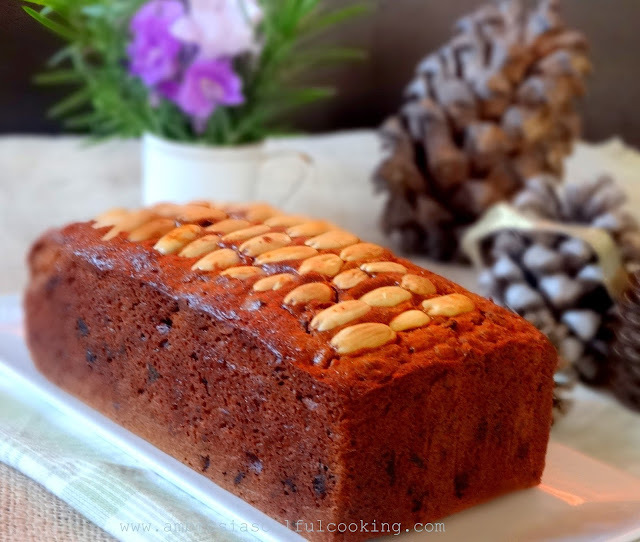 Your loaf cake looks so yummy and perfectly baked! I am in love with fruit cakes lately and yours looks very tempting. Like you said in your post, there is something magical about December that makes you want to bake! :) Must have been lovely baking as a family. I could just imagine by through your writing. Merry Christmas to you all!